Is Removing Asbestos Floor Tile Dangerous? Is removing asbestos floor tile dangerous? Thanks to the 24-hour news cycle, it’s been easy for us to forget about asbestos since last year’s controversial “Make Asbestos Great Again” flap. But asbestos work is about 80% of what I do, so I deal with removing asbestos floor tile almost every day. Removing asbestos floor tile does not have to be dangerous, but it sometimes is. Many people think the only dangerous asbestos removal work involves friable asbestos. Some people think removing asbestos floor tile manually is totally safe, anyone can do it, and is pretty much risk free. We recently had a project that suggests the opposite: removing asbestos floor tile can be dangerous. Asbestos air sample results show airborne asbestos fiber concentrations that exceeded Environmental Protection Agency (EPA) asbestos clearance levels. 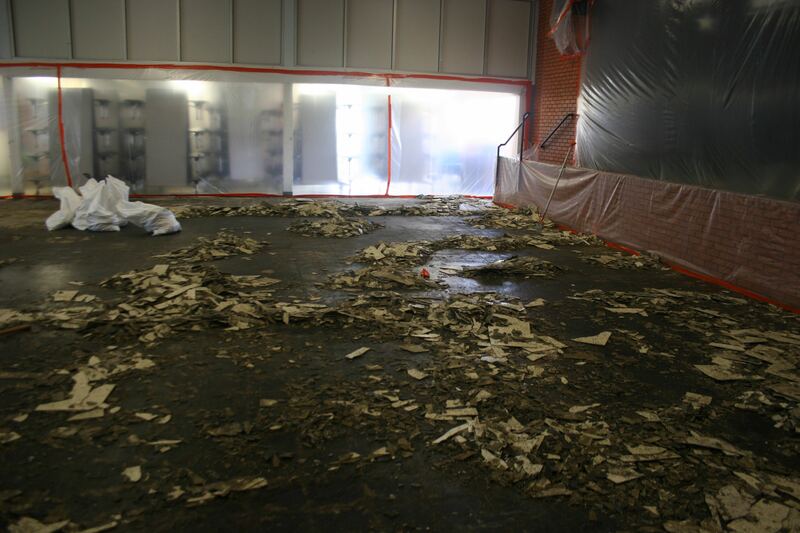 We had a project last November involving removal of asbestos containing floor tile and mastic. The job was pretty straightforward – a small, unoccupied office building. We were engaged to provide asbestos air monitoring during the project, and asbestos clearance air sampling at the conclusion. The asbestos abatement contractor planned to remove the asbestos floor tile and mastic using hand tools only. According to some high level decision makers where I live, this approach allows pretty much anyone to remove and dispose of asbestos floor tile. I’ll avoid discussing my stance on asbestos floor tile and mastic, and what I think asbestos regulations should say about this type of work. The project appeared to go exactly as planned. The abatement contractor finished removing asbestos floor tile and mastic, and we collected asbestos clearance air samples. Our sampling technician got the samples to the lab, and all we had to do was wait for the lab report. The EPA’s recommended clearance level for asbestos is 70 s/mm² . In this case, each of the five asbestos clearance air samples exceeded the EPA acceptable airborne asbestos fiber concentration for asbestos clearance air samples. What’s important here is what the report says – and what it doesn’t. Most often when we see asbestos clearance air sample failures, the lab reports samples as overloaded with dust and debris. Notice that’s not the case here – the lab found honest to goodness asbestos. And in pretty high numbers. When I told the contractor, he was shocked. This wasn’t our first failed asbestos clearance. It happens, and sometimes it’s difficult to pinpoint the reason. And this wasn’t the first time this happened on an asbestos floor tile job. Do enough jobs of this kind and the law of averages will catch up with you. Did the contractor get complacent and not take the job seriously? I mean, removing asbestos floor tile isn’t dangerous, right? But, no one ever fails clearance on a floor tile job! Chris, you must have messed up the samples! Asbestos clearance air samples sometimes fail on jobs where we’re removing asbestos floor tile, but not often. When it does, it’s usually associated with sloppy cleanup or someone gets in a hurry. I tried to find out if the final cleanup was rushed or not thorough. The removal work took a week, about the right amount of time for a job this size. The work area looked as clean as the average asbestos abatement work area. Asbestos clearance air sampling went as usual. There was no smoking gun here, just a failed asbestos clearance air sample set. Despite conventional asbestos abatement work practices, a thorough visual work area inspection and aggressive asbestos clearance air sampling, and analysis using Transmission Electron Microscopy (TEM), the airborne asbestos fiber concentrations exceeded Environmental Protection Agency (EPA) asbestos clearance level. Keep in mind the abatement contractor did not use a floor tile removal machine or any power tools. This work was done using hand tools only. According to this asbestos air sample data set, removing asbestos floor tile can be dangerous. I’ll concede this is one project out of many, and not a scientific study. But the numbers don’t lie. After completely re-cleaning the work area and collecting another asbestos clearance air sample set, the work area met asbestos clearance criteria. What if this were a project where a General Contractor did the work themselves, using no work area containment, untrained and unprotected workers, and they tossed the material in a dumpster containing general construction debris? And what if there were no asbestos clearance air sampling afterward? I’m not piling on contractors – there are plenty of building owners, architects, and engineers who think removing asbestos floor tile is not dangerous. How often does this happen? I’m scared to know the real answer. How Can You Avoid Problems if Removing Asbestos Floor Tile? There are projects right now where workers are removing asbestos floor tile under these circumstances (or worse). Most certainly some will cause similar airborne asbestos fiber concentrations, and no one will ever know. Too many people think removing asbestos floor tile poses little to no risk. Even worse, I suggest that most of these instances are avoidable if we use the right approach to removing asbestos floor tile. One way is to use our checklist for renovation and demolition projects. Agree, disagree, or want to share your story? Disagree with what I’m saying here? Do you have any project stories you’d like to share? Submit a comment below or email me. Or if you’d like help avoiding environmental problems on your next renovation or demolition project, email me.